Celtic Woman is a highly successful female vocal group formed almost ten years ago and which performs traditional Irish songs as well as modern songs both on a series of sucecssful albums, and also on regular concert tours - particularly in the US. 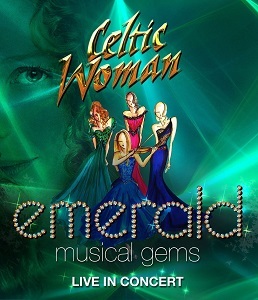 Emerald is their latest release and is a live show available on CD, DVD and BluRay. It's a highly choreographed performance with the visuals clearly considered to be a key part of the show. The combination of singing, music and Irish dancing and a choreographed performance gives it a very theatrical feel - more like watching a musical at the theatre than a concert in some ways. It's a singing equivalent to Riverdance really. I have to be honest - while there is plenty of great singing, music and dancing, I did find the fact things were so polished and there was so much posing for the camera or audience that it felt like a Disney production rather than the real thing - a bit like comparing Disney's "The Lion King" to watching a wildlife film - one is real and the other is a cute sweet version. It comes down to what you want to see/hear. While the show was very impressive I would personally prefer to see a more stripped-down performance with more focus on the songs and less on the show, but I do realise that for many people things are the other way round. If you like Celtic music and Irish dancing then Celtic Woman do put on a very impressive show and this DVD is a great release.